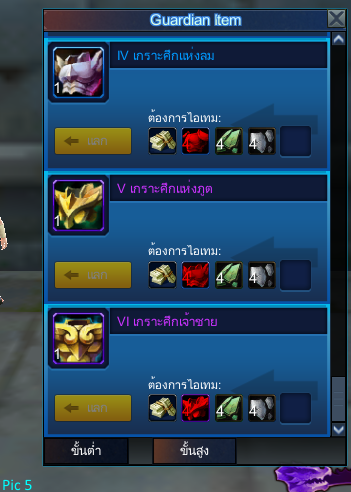 I play on the Thailand Athena server, so I am not sure if this guide will help with all versions of SSO. Hopefully, it does or at least gives players some sense of direction when it comes to their guardians. Alright, semi-first off, you should be aware that you will need to work for guardian pts when you reach level 59. These points will basically stock up and unlock more items that you can buy from the guardian merchants. The less pts you have means the more limited that items will be available to you when you shop for your guardians. 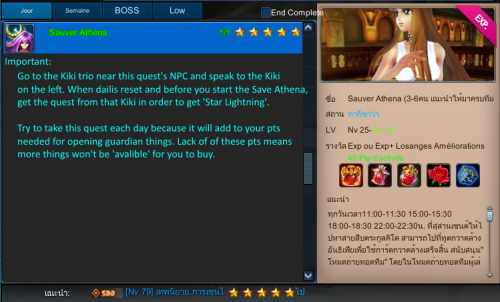 The main way to get these pts would be to finish the main guardian quest and then talk to one of the Kiki merchants after each dailies reset. Most players take this quest before doing the Save Athena daily. 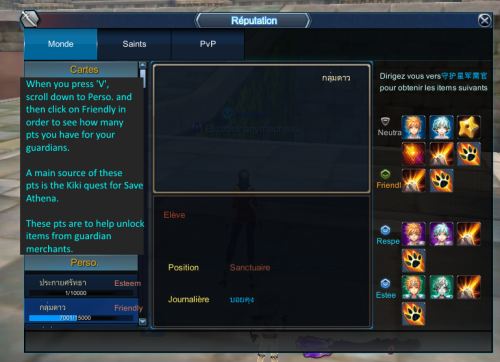 I believe Kiki will give you 1000 pts per quest each reset until your guardian bar reaches its max value. If he doesn't have a yellow quest marker above him, check your quest list to see if you've completed the main guardian quest. Okay, you can have up to 6 guardians. 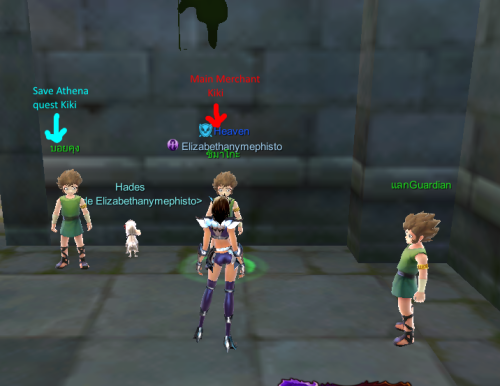 When you do a quest for Kiki on Death Queen’s Island and get your first guardian at lvl 59, there should be five ‘locked’ guardian slots. 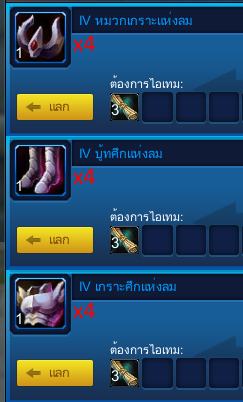 To open these, you will need to buy from game’s shop (press J). Each of these Hearts of Zodiac will unlock one slot for a new guardian. When you have them and are ready to open your guardian slots, open your innovatory and your guardian menu. Then just click on the ‘lock’ icons in order to active them. However, do not worry about having to buy all at once to open each slot. Do so at your own pace. Now on to the Guardian Menu. You guardians will appear on the left side of the menu when you active them from your innovatory. The main guardian (which will follow you and aid in battle) will be the one on the very top. 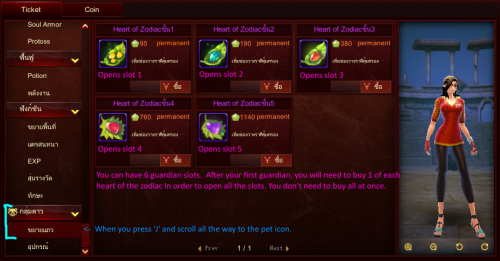 Spare guardians will appear in slots 1 through 5 (these are unlocked with the Hearts of the Zodiac. Mine are currently all unlocked, which is why they have a blue circle icon instead of a ‘locked’ icon). 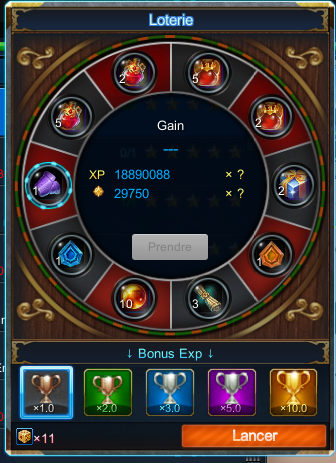 Your guardian’s skills will appear in the four dark slots at the top right. You will need to unlock these slots to using Spectrum Hearts. Speak to the Kiki in the middle. 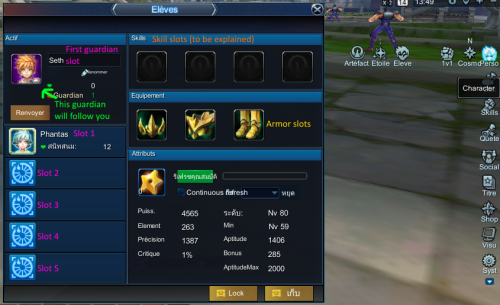 Unless you are looking for armor (which I’ll explain in a moment), open the first option on his pop up. Spectrum Hearts would just like Hearts of the Zodiac. 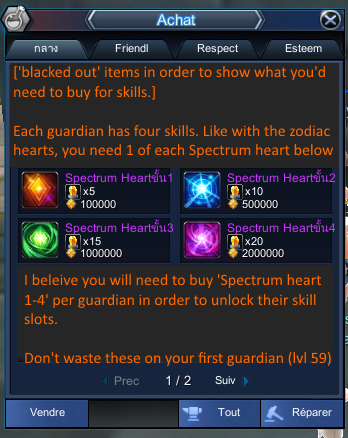 However, you will need Spectrum Heart 1-4 for each guardian that you want to unlock skills for. Pro tip: only start using Spectrum Hearts to unlock skills after you have lvl 79 guardian or up. [I'm not to familiar with guardian skills yet. However, it was explained to me not waste adding skills to a guardian until you’re sure you know that skill is best for your guardian. Unlike armor, skills cannot be removed from a guardian when you wish to switch guardians. Okay, now for the tricky part. Armor for Guardians. This is were you need to click the second option on Middle Kiki’s pop up. You should see a list like this. 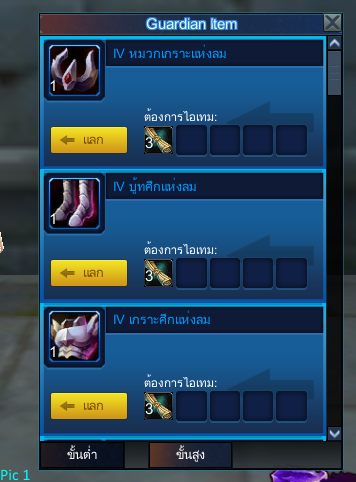 You shouldn’t have to worry and be able to get the basic armor (that has IV in it’s name) that appears on the first pic. The main objective is to try and get all golden armor that has a roman numeral V in it’s name. 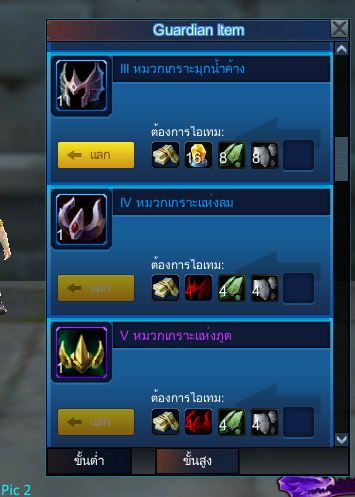 Now, you will need 4 of each basic armor (IV) in order to trade that in for the gold (V). 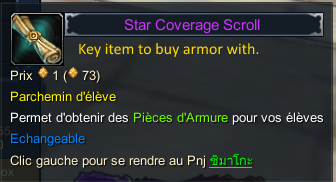 Now, the gold armor cannot be brought with star scrolls. 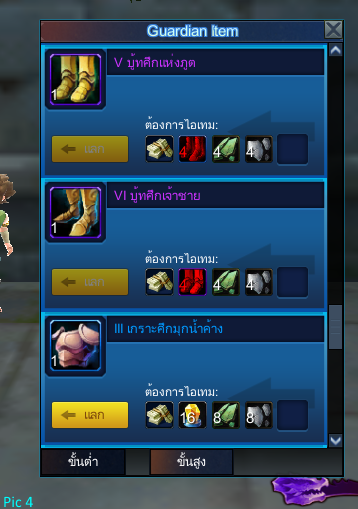 Meaning, you will need all the basic armor, non-trade-able money, Lightning Stars, plus the green and silver cloth items for buying it. 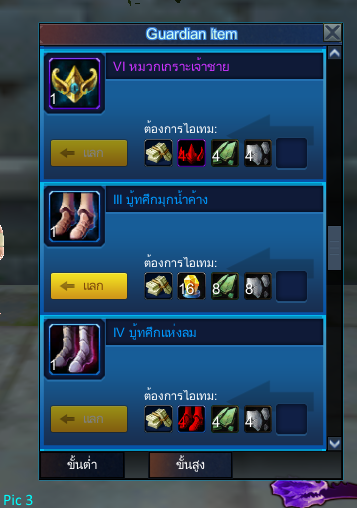 When you have everything each gold armor piece requires, you will be able to buy 1 full gold (V) armor set. Repeat this same process to get another set for your guardians (if you desire to do that). 'Star Condensate' can add some pts your guardian bar. There is a limit to using this item, so don't rely on it for getting a lot of guardian pts. It's just a small boost. 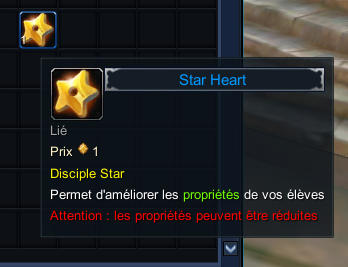 Star Hearts can be bought and feed to your guardians. This item increases a guardian's aptitude, which I believe increases their over all power. Your guardians will affected your power level (pl). 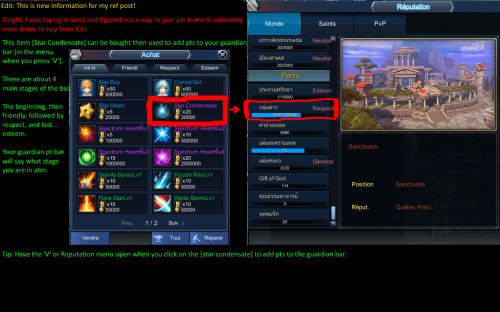 The more guardians you have (especially if you get six that match your current lvl) , as well as giving them armor and feeding their aptitude will increase what pl you currently have. For now, this is everything I can think of regarding guardians. Feel free to ask me questions or point out if I missed anything.